1. 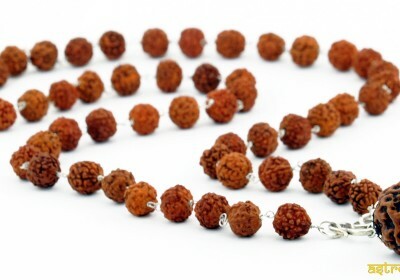 RUDRAKSH MALA – Universally applicable for all mantras and deities. 2. SPHATIK MALA – For chanting the mantra of Goddess Saraswati and for planet Venus. 3. TULSI MALA – For Maa Gayatri,Lord Vishnu, Lord Rama,Lord Krishna and for planet Jupiter. 4. BLACK TULSI MALA – For Maa Kali and planet Saturn. 5. RAKTA CHANDAN MALA – For Goddess Durga and planet Mars. 6. RED CORAL MALA – For Lord Ganesh,Lord Hanuman and planet Mars. 7. LOTUS BEADS MALA – For Goddess Mahalaxmi. 8. TURMERIC (HALDI) MALA – For Maa Bagalamukhi or Maa Pitambara.